Deep in the throes of Fimbulwinter, Viking heroes rise to the challenge to stem the dark tide that has engulfed Midgard. The sun and the moon have been devoured and the worlds on the cosmic tree Yggdrasil have been cloaked in a penumbral shroud. The gods are reinforcing Asgard for the coming fury of the giants. The war cry has echoed throughout every corner of the world: will you heed the call? 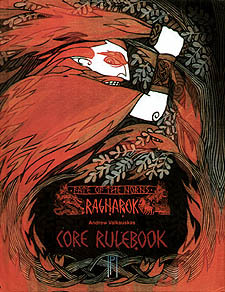 Fate of the Norns: Ragnarok Core Rulebook is an all-inclusive game that will allow you to create customized characters who will embark on an epic saga. You will partake in a visceral and tactical combat system that rewards team-play and good strategy. Using the innovative Runic Game System, you will spin the tale of heroes and epic feats in a hostile world. Mystical runes (included as printout and also available in semi-precious stone sets) for a game driven by the Runic Game System - no need for dice!